The chili peppers are an excellent seasoning and a better natural remedy. Thanks to capsaicin (the compound that gives them the spicy flavor) it has a powerful effect on the body. Encourages better circulation and have a proven anti-inflammatory effect. They are excellent in the prevention of many diseases, particularly prostate cancer and thrombosis. They keep the level of triglycerides and cholesterol in check, and prevent the formation of blood clots. Today there are many varieties from mild taste that you can easily be cultivated in a pot. In this way you will secure yourself with a constant source of fresh vitamins and minerals. Read on to learn what you need to grow hot peppers at home, and how to get the most out of it. Why is spicy food good for health? Spicy food is the basis of many traditional dishes of the world, and all of them have chili peppers. This powerful spice that won the world after Columbus' discovery of America represents only a variety of a common peppers Capsicum annuum. In fact, all kinds of peppers are an important source of vitamin C, while bright red peppers have large amounts of beta-carotene, pro-vitamin A. These vitamins play an important role in the immune system and in preventing infections. However, the main advantage of hot peppers is capsaicin, the oil is concentrated in the veins of the fruit. Careful with the chili peppers! This food is definitely as they say “poison comes in small bottles". The bitterest varieties of chili peppers are the very least. Some species are so fervent that they are advised to be avoided, or at least not eaten in its raw state. Sneezing, coughing and runny nose occur due to irritation of the upper respiratory tract. In contrast, excessive exposure to chili causes overheating and sweating. Also, if you prepare chili peppers in a jar, do not overdo it with the consumption of the same. Chili shock literally can temporarily turn off the brain due to abnormal breathing and insufficient blood flow to it. In order not to lose consciousness, you should avoid large quantities and extremely chili peppers. Which varieties are less spicy? Colorful peppers are not necessarily spicy but most of them are. Typical types with the intense colors, like Christmas peppers, Jamaican hot or episcopal caps are very spicy. They are not recommended for eating, at least not in their raw state. Fortunately, today there are several varieties of mild taste that can be used every day without consequences. Most famous mild types are jellyfish and mini-white. If you cultivate peppers in pots, all year round you can have a constant source of fresh vitamins and minerals. For chili peppers cultivation largely depends on the variety, most often they are sown in March or April. Peppers corresponds to moderately moist soil humus. It should be loose, but the recommendation is to add a ten percent of stones (garden perlite). The seed is distributed evenly over the surface of the substrate coated with a thin foil that is only a few millimeters thick. Avoid direct pouring of water. Pot cover with transparent nylon foil or jar, and place it in a dark place in a temperature below 15 degrees. In order to prevent excessive humidity, twice a day, remove the foil or glass. When the plants begin to sprout, move the pot to a light place, and remove the protection. Having developed several true leaves, transplant them into individual pots. When they reach the height of 12 cm, move them into permanent containers. Pot with pepper put in a warm place, but not near radiators, protected from drafts. It needs plenty of light but not direct sun. During summer peppers grow best if they are outside. During the colder part of the year they should be kept in a warm place. Preferably, the air temperature should not fall below 10 and not exceed 18 degrees C.
While intensively growing and flowering, ornamental peppers should be watered regularly and do not allow excessive drying of the land. When flowers begin to turn into fruits, water the plant less. Then only spray twice a week - so they receive additional moisture. When does the harvest begin? Full grown pepper arrives during the summer months, but if the plant is grown under optimal conditions, it will give fruits until late autumn. Seeds and planting of ornamental peppers can be detached from the plant when they are ripe. Since it dries in the air in a few days, put it in a paper bag and sow next spring. Capsaicin, the compound that makes peppers spicy has a strong effect on the body. It stimulates circulation and has a proven anti-inflammatory effect. Therefore, this complex alkaloid is widely used in medicine. It is used to relieve pain during neurological conditions - diabetic neuropathy. It is inevitable for muscle pain, sciatica, but also due to arthritis (prevents inflammation of the joints). It relieves symptoms of psoriasis (Anti-inflammatory and reduces itching). Chili peppers relieve the symptoms of colds and flu, since it is an antiseptic and works against bacteria. It also plays a significant role in cleansing the body. It speeds up the metabolism and is a defense of mechanisms of the body, it also stimulates digestion. All kinds of peppers are an important source of vitamin C, while bright red chili peppers contain large amounts of beta-carotene. They are the undisputed for proper operation of the immune system, and to prevent infections. If you eat chili peppers you will eliminate the chili sensation with one sip of milk. It will block the receptors of taste and pain. The sense of hotness is transmitted by pain receptors. Paprika of an extremely bright red color is known as cayenne pepper. It’s very spicy fruits are dried and milled into cayenne pepper. This spice is the foundation of Mexican cuisine and Far Eastern dishes. The main ingredient in hot peppers reduces the number of thrombocytes. It lowers blood pressure and cholesterol levels and prevents blood clots. Additionally, capsaicin, gives the elasticity and permeability of blood vessels. All this has a direct impact on reducing the risk of heart attack and stroke. Nations that in traditional cuisine use abundant amounts of chili peppers - much less suffer from these diseases. Heart failure, stroke and thrombosis are a rarity. Hot peppers stimulate better circulation, and therefore the myth of their aphrodisiac properties is not entirely without merit. They increase the sexual desire and effectively affect both men and women. 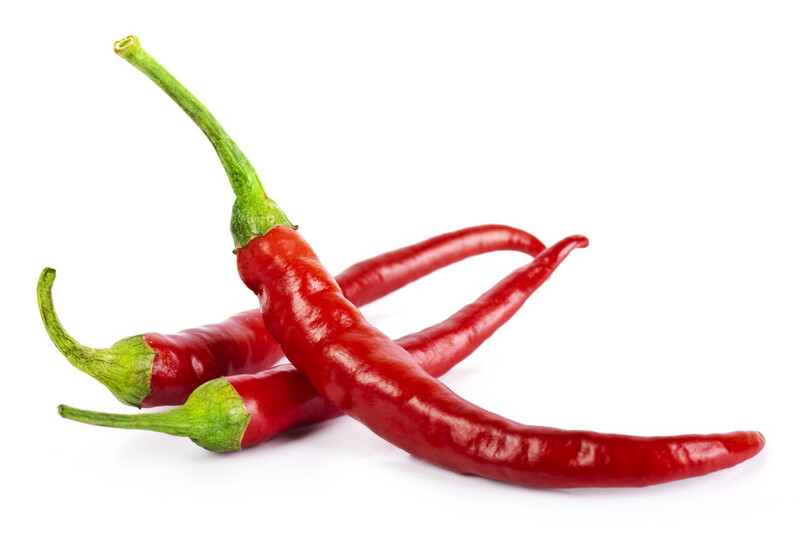 Studies on prostate cancer have shown that capsaicin suppresses the growth of cancer cells. Tests were performed in the United States and Japan which confirmed its positive effects. In fact, under the influence of this compound comes to complicated processes, which resulted in the death fifths of cancer cells (apoptosis). Therefore, to prevent this disease recommend are supplements of capsaicin derived from hot peppers variety - Bishops cap. Capsaicin stimulates the secretion of mucus that protects the gastric wall damaged by Helicobacter infection. In short, chili peppers, quite contrary to popular belief has a positive effect in the case of ulcers. However, if you notice that its spiciness is something you cannot tolerate, do not eat it. Heat the olive oil slowly then cook onion on it for a few minutes. Add the garlic and a carrot, and cook for a few more minutes. Then insert beef, bay leaf and hot pepper, sauté briefly. Pour over all with the broth or water, reduce the heat and simmer until meat is tender. Then add the cooked tomatoes, season with salt, a little pepper and keep the heat on for five minutes. Finished chili broth pour into a bowl and sprinkle on top with parsley. Clean onions and finely chop them, simmer until it becomes translucent. Chicken cut into sticks and sauté with onions and add tomato juice, chopped pepper, salt and pepper and leave to simmer for some 20 minutes. When the filling is ready, add the finely chopped parsley, basil, oregano. Stir well, simmer for a few minutes and remove from heat. Tortillas or pancakes, arrange on a baking pan and sprinkle with grated cheese, and bake in the oven for ten minutes. It takes this long for cheese to melt. On each tortilla, put two tablespoons of the filling, roll it and put it in a greased ovenproof dish. Bake in oven for 15 minutes at 180 ° C.
As you can see chili peppers have found their application in a number of specialties. We recommend the article about spicy horseradish.